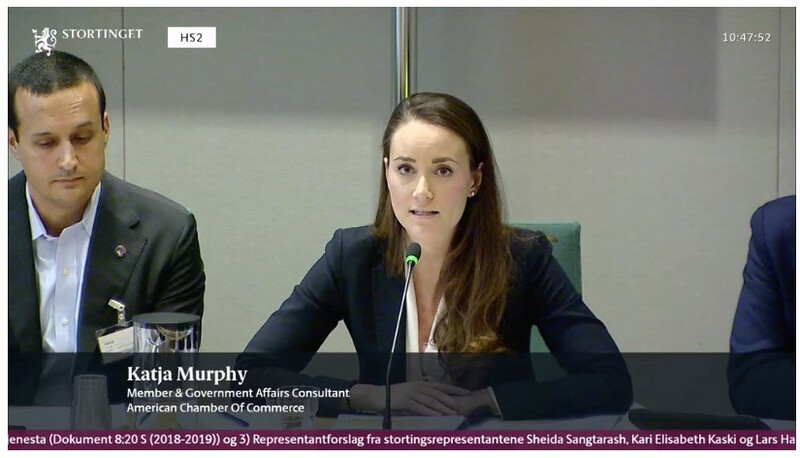 “AmCham sees no particular reason why there should be a difference in the public procurement of pharmaceuticals as compared to procurements within other sectors – or the health sector in general,” said Katja Dahl Murphy, AmCham’s Member & Government Affairs Consultant, during a hearing examining the confidentiality of pharmaceutical discount pricing at the Parliament earlier today (Thursday). “With that taken into consideration, it is vital that the same principles for competition are maintained — also for the pharmaceutical industry,” Dahl Murphy said. AmCham further emphasized that, since confidential pricing was introduced in 2016, the Norwegian authorities’ procurement processes have been in accordance with applicable rules and regulations. These are the same practices as utilized by other public sector bodies for years. Dahl Murphy succinctly presented AmCham’s key points in the hearing organized by the Health and Care Services Committee. She continued by highlighting how total costs of medicines are indeed publicly available, as are maximum medicines prices. What is confidential, however, is the discount provided by pharmaceutical companies to the authorities. “We have recently witnessed examples illustrating how negotiations and tenders with confidential pricing can lead to substantial price reductions. Making these discounts publicly available is likely to increase pricing of — and subsequently inhibit Norwegian patients’ access to — new, innovative products,” Dahl Murphy explained. During her allotted time, Dahl Murphy also emphasized AmCham’s position that transparency should be the guiding principle within public health procurement, both regarding honorariums received by healthcare personnel and through Parliament-approved tender prioritization criteria. Collaboration between industry, health personnel and decision-making bodies is essential for developing a sustainable healthcare industry in Norway. Dahl Murphy also emphasized how the subject of Norwegian procurement confidentiality has been a topic of regular discussion during US-Norway bilateral trade talks over the past 15 years. 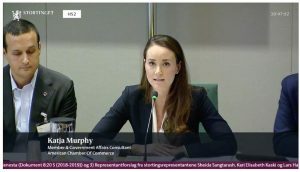 “AmCham remains concerned about the motion discussed today and would like to emphasize that making public sector price reductions publicly available information could precipitate serious consequences for international trade, as well as how public procurement processes are conducted in other sectors,” Dahl Murphy concluded. Please see the statement in Norwegian here or the full hearing submission here.